Artful Affirmations: Tea Cup Tuesday-Happy Thanksgiving! What a beautiful teacup, Terri! 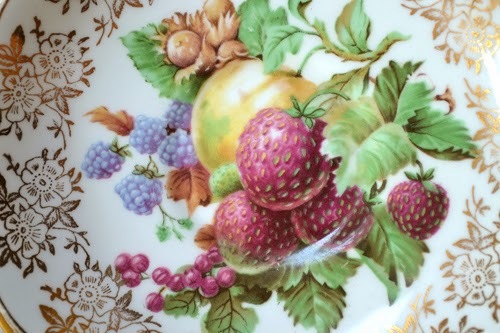 I love all the gold and the fruit motif. It's a perfect teacup for this week. I shared some new Spode Christmas mugs this week. I hope that's OK. Happy Thanksgiving, my friend, and it's nice to have you back. 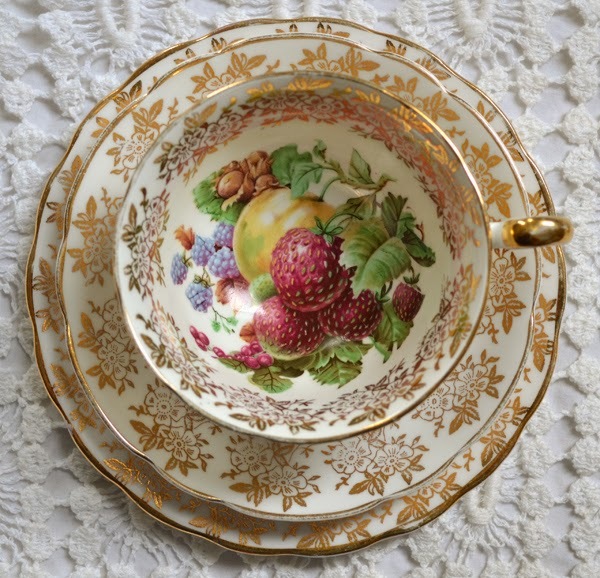 I'm always on the look out for beautiful tea cups like your - I too love the fruit and the gold - it's exquisite. These cups are very difficult to find in New Zealand. Thank you for hosting your lovely party. Oh I just love this cup! Life is very hectic right now due to visitors, and family illness. 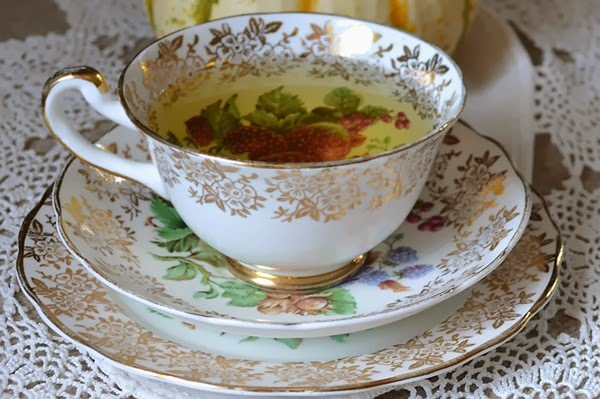 A chamomile tea in a beautiful cup sounds like the perfect antidote. My day feels better already! Happy Teacup Tuesday! Have a blessed week! as alwayes a very beautiful post , with your amazing cups...this is gorgeous with all the gold!! Sweet friend, I wish you happy preparations for Thanksgiving , and a wonderful week-end celebrating. So true that we treasure these special times more and more each year. Terri your harvest cup is so elegant and beautiful. And I too love chamomile tea! I may need extra today as we're supposed to get hit with some mixed precipitation and then lots of rain overnight. A happy Thanksgiving to you and your loved ones. Oh, Terri -- this harvest trio is gorgeous. I think I'm in love! :) Happy Thanksgiving! Happy Tea Day! Thank you for hosting. Hi Terri. It is a busy time, isn't it? I love your fruit-full teacup! Gorgeous. I can't do chanonile...allergic to it...but it's a lovely photo! Have a wonderful week and Thanksgiving with friends and family! We missed you last week. Gorgeous cup as always! Such a bountiful pattern to represent all the many many blessings we have in our lives, friends being one of the most important ones! I will be talking to you soon sweets! Hugs! This set is such a golden delight and so suitable for autumn and Thanksgiving. 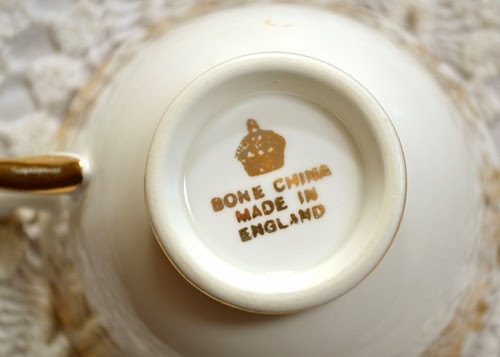 what a wonderful tea cup you present today. All the autumnal gifts of nature are in there. You photos are the pure delight. I wish you a wonderful Thanksgiving and thank you for hosting this sweet tea time. 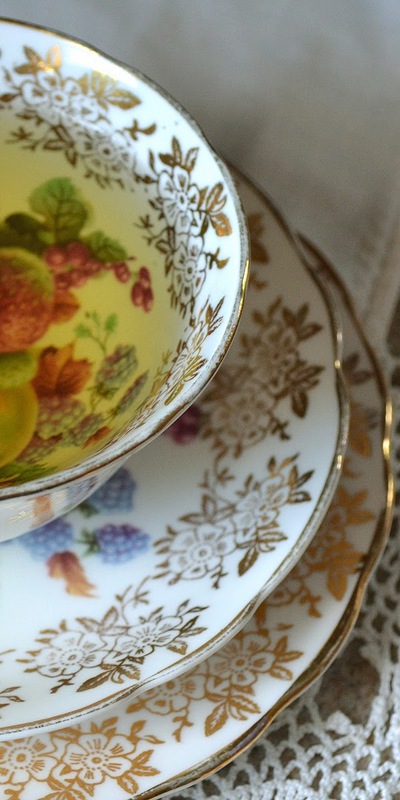 Your teacups are always pretty, dear Terry:)Happy Thanksgiving. You are so right Terri. Time with our families is so precious and I too feel the need to cherish even more the times we have together. Your teacup is so beautiful. In a few days though, I'll be putting away my Autumn decorations and dishes to fully embrace my favorite time of the year, Christmas ! Happy Thanksgiving Girlfriend! Hope you have a blessed holiday. Brother on his way here from St. Louis and should be here any minute. Hugs! Terri, the harvest cup is beautiful...look at those plump berries...mmmmm...it looks like they could add to the flavor of the tea. Gracias por pasar a visitarme sin haber preparado mi taza de té. Es que tuve algunos problemas personales y de salud. Hermosa tu vajilla del martes de té, parece vajilla imperial. Bella. So beautifully said and written Terri..I agree.family and loved ones are the greatest treasures! 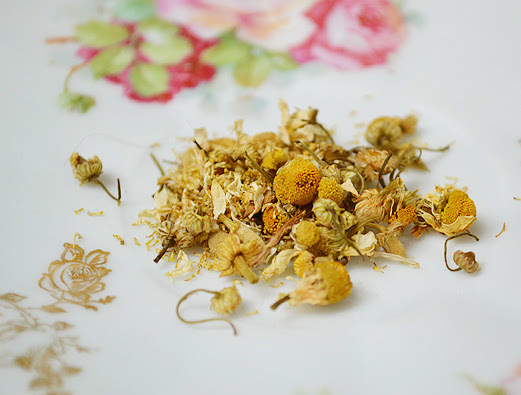 Beautiful tea..love the shot of the chamomile..and such a beautiful tea! Wishing you and your loved ones a very wonderful TG ..full of love and blessings!